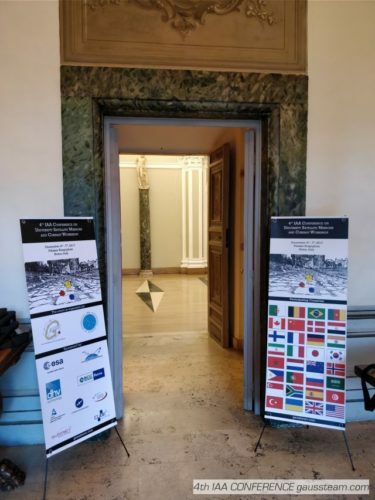 Following the tradition of the three previous editions of 2011, 2013 and 2015, the 4th IAA Conference on University Satellite Missions & CubeSat Workshop has represented an international forum on the main topics of the small satellites’ community. The event is organized by GAUSS Srl together with the International Academy of Astronautics (IAA) every two years and this edition was sponsored by ESA and AAS. The Conference offered technical sessions on launch opportunities for universities, ground segment operations, space debris, new perspectives in microsatellites application and several presentations dedicated to CubeSats missions. The event took place from December 4th to December 7th, 2017, in Roma (Italy), at Palazzo Rospigliosi, a magnificent location in the city centre. The deadline for the Paper Submission was November 15th extended to November 26th, 2017. Here you can find the zipped archive containing the templates for preparation of the manuscript: an MS Word version (doc file) and a LaTeX version (MikTex, Lyx, TeXShop compatible). Please, follow the guidelines and layout of the templates, because of publishing requirements. The Papers submitted for the Conference have been indexed and published as Proceedings in a dedicated volume of the American Astronautical Society “Advances in the Astronautical Sciences” series by Univelt, Inc., USA. Moreover, the best Papers shall be published in Acta Astronautica after peer review. Here below you can find the Conference Program. Moreover, within the Conference, the Italy IAA Regional Meeting was held on Tuesday December 5th.